A new report shows that some groups of Los Angeles County residents have the highest levels of well-being in the United States while others have some of the lowest. 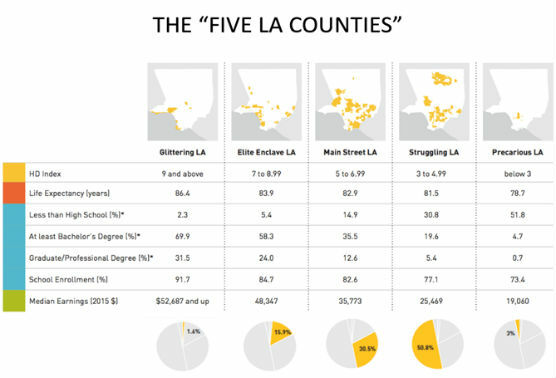 The findings are based on a cutting-edge formula that combines data on income, health, and education and offers an unprecedented portrait of LA County. The American HD Index measures how people are doing, offering a more accurate perspective on opportunity and well-being. “A Portrait of Los Angeles County,” commissioned by the LA County Office of Child Protection and funded by a consortium of 14 grantmakers and the Los Angeles County Quality and Productivity Commission’s Productivity Investment Fund, is expected to be used by county leaders in making future decisions about where to target resources. “The portrait provides us with critical information about the well-being of communities that is greatly needed to effectively target prevention supports to the families who need them most,” said Office of Child Protection executive director Judge Michael Nash. On the 10-point HD Index scale, the highest- and lowest-scoring communities are separated by an astounding seven points. In LA County, San Marino, Manhattan Beach, and Palos Verdes Estates top the list, all scoring more than 9.3 on the HD Index. Lennox, East Rancho Dominquez, and Florence-Graham each score lower than 2.7. Within the city of Los Angeles, the gap is even larger. Bel Air-Beverly Crest and Brentwood-Pacific Palisades are on top with scores of 9.51 and 9.24, respectively. Southeast LA is at the bottom with 2.26. “A Portrait of Los Angeles County” is a collaborative effort between Measure of America and partners that include Southern California Grantmakers and the Los Angeles County Office of Child Protection, Department of Children and Family Services, and Department of Public Health. It was made possible with funding from the Annenberg Foundation, BCM Foundation, Blue Shield of California Foundation, California Community Foundation, The California Endowment, The California Wellness Foundation, Citi Community Development, Conrad N. Hilton Foundation, The James Irvine Foundation, Leonetti/O’Connell Family Foundation, Los Angeles County Quality and Productivity Commission—Productivity Investment Fund, The Ralph M. Parsons Foundation, Sony Pictures, United Way of Greater Los Angeles, and the Weingart Foundation.